Over the past few years, accessibility options for the blind or visually handicapped have opened the world of computers to the blind or visually impaired. More and more blind and visually impaired computer users are taking to the keyboard every day. Before you spend a lot of money on the latest JAWS program or some other expensive application, check out what Windows can do to help you with your impairment. The first step is to open the Display properties control panel. You can get there by right clicking on your Windows desktop and left clicking on properties, or you can access it through your control panels window. Once you have the window open, you will notice a series of tabs across the top. You will be looking for the “Appearance” tab. Once you have the display properties window open, you need to click on the Appearance tab. 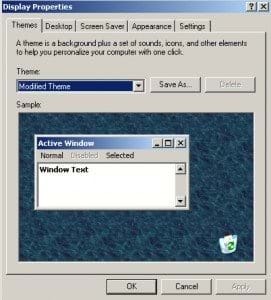 This tab will have a number of selections that allow you to adjust the look and feel of your Windows graphical interface. For example, if you are visually impaired, but still sighted to some degree, you may wish to turn on the high contrast mode of Windows. This mode eliminates gradients and overlays white over black whenever possible. This makes it easier to read text and see option buttons. There are different degrees of High contrast mode, so experiment until you find the option that best suits your needs. You can turn contract mode on or off from this interface. As you can see in the graphic on the right, there are many compatibility options for the visually impaired. These options are peppered in with other color schemes intended for the sighted. 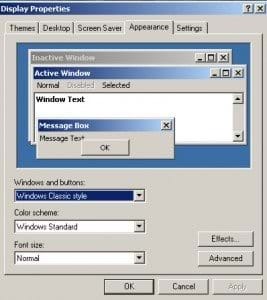 In fact, you can even turn off all color schemes by selecting Windows standard or Windows classic, depending on your preference. The screen shot on the right was taken from a Windows XP Home Edition PC, so your list of options may vary slightly. Once you have selected the color scheme you are comfortable with, simply click on the apply button and then click on the ok button. The Display Properties window should close and your Windows interface should now be set to the particular scheme you selected on the previous screens. If compatibility options are not enough to accommodate your visual impairment, you can also check out these applications. Some cost more than others, but all of them pretty much get the job done.